I often spend long periods in out of the way places observing changes in a complex relationship between nature and the man-made and considering the nature and relationship of transience and permanence. The salt martsh and mud-flats of the north Kent marshes for example, is a place I often return to. I once followed the remains of a Saxon wattle path on Burntwick Island leading to a fish trap buried beneath inches of soft clay. On Darnett Ness, I watched a Romano British burial urn gently exposed by flowing tidal water, revealing cremated bones interred over 2000 years ago (for the mile wide mudflats of today were once farmland dating back as late as the fourth century AD). A few years ago on Dead Man’s Island I went in search of the remains of the tomb of Sidney Bernard, ships surgeon on the sloop Eclair out of Madagascar, which in 1845 was overtaken by yellow fever. While most of the men died and were buried in a mass grave, the surgeon was given a more public stone memorial surrounded by iron railings. The entire edifice is now often below water or covered to inches of its top in mud, and I only managed to glimpse it from afar across the mid-tide saltings. I love events marking human timescales as much as geological layers, natural history and seasonal change that together give places intimate and intricate narratives. However, if on the one hand we have such a fragile and transient impact on the land, on the other our footprints are indeed heavy and the scars we leave behind are not so easily healed. 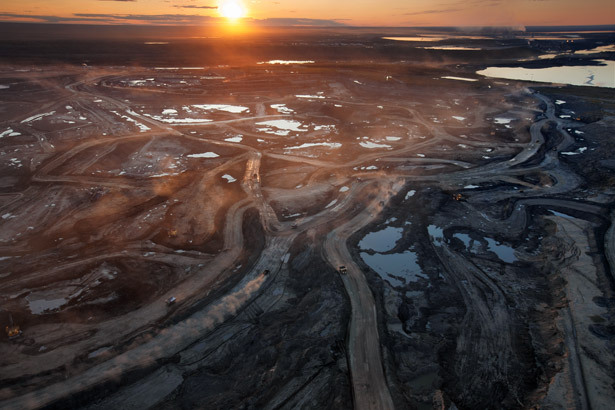 I was recently party to a debate in Calgary about the landscape ravaging extraction of tar sands in northern Alberta which provides a provocative international background to contemporary oil politics, economiics and culture. It is not wholly disconnected from the history of Dukes Wood, in another age when demand for oil outstripped availability. The history of oil extraction was of course very evident when I made my first visit to Dukes Wood last year, where small maintained clearings amid the trees are still home to the original ‘donkeys’ atop wells sunk by American oilmen during the 1940s. 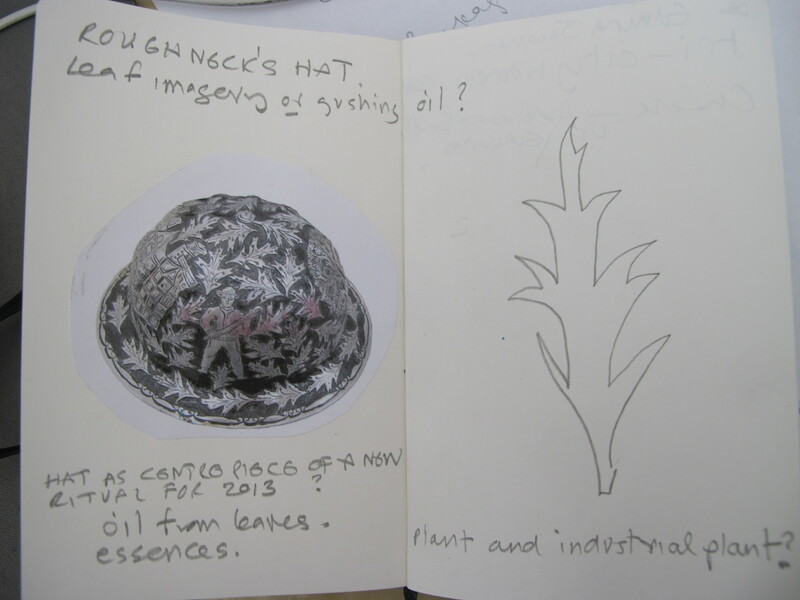 In the little on-site museum is a ceremonial helmet, whose repeat leaf motif could also be read as plumes of gushing oil and reference the connection across many millennia of living plantlife to hydro-carbon deposits. I began to consider the oils of living plants as a potential creative source for a work about Dukes Wood; to refine an ‘Essence of Place’ from its living flora – a new and affirmative ‘Spirit of the Wood’ and embodiment of living nature in a world where many are disconnected from its meaning. In an age when nature is increasingly treated as a mere commodity to be owned and exploited for short term private gain, to create my own product from that aims to contextualise our relaionship with this old oil landscape in a new way. 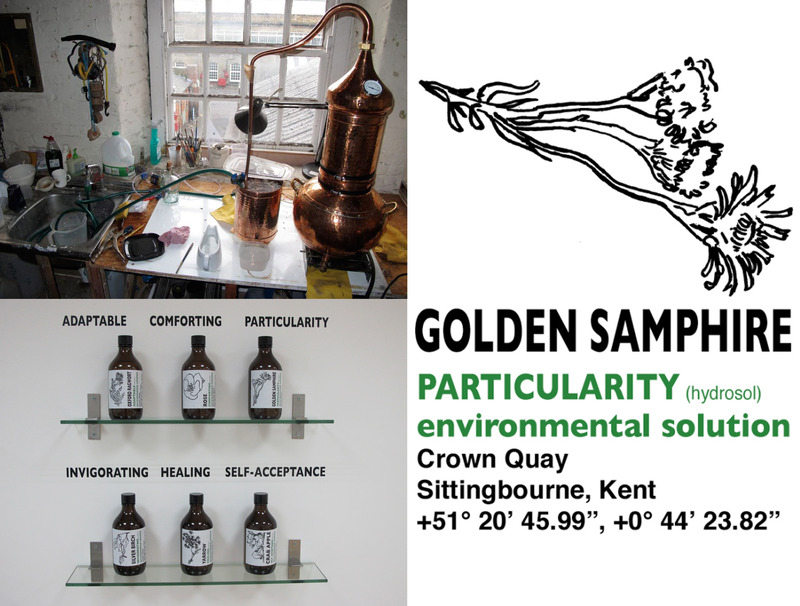 These ideas arise from a project I completed last December on the urban fringes of Medway and Swale, where (guided by ‘Faith’ a fly tipped doll from Sittinbourne), I distilled essential oils from wasteland flora to make a unique ‘Eau de Bordure’ as well as eighteen different ‘Environmental Solutions’. The names of these rescue remedies for the neglected edges can be read out like a protective charm. The development of this work can be explored at www.urbanfringes.wordpress.com . I will spend my days in the wood guided by local people to identify and then distil a variety of commonplace seasonal aromatic plants, whose essence might be blended and bottled. I will infuse the process with a respect for the objectivity of chemistry, but valuing more the alchemical, subjective and emotional nature of each experience. I will give myself license to nose around in search of olfactory sensations as Perfumier to the wood. In being sensitive to its different processes and particularity of flora, I want to become curator of the work of wood and amanuensis to its flora; to help give mute nature a voice. I am considering making an invitation to Duke’s Wood, in the form of spritzed cards that could be ‘scent’ to enchant and attract visitors to its everyday beauty; a spring collection to release and please during the summer or autumn. I may bottle the essence and leave it amid the flora that surrendered it, to share as geo-cached treasure with visitors who might enjoy its captured but ultimately fleeting pleasure. I would want also to offer a contrasting reminder of the stark realities of global oil demand and the continuing pressure on nature and on our sense of belonging to the world, which our life styles so threaten.